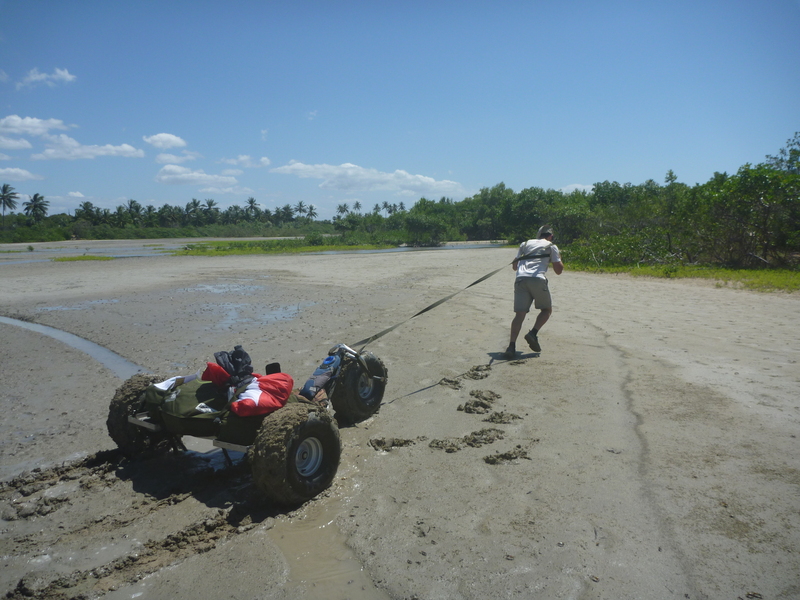 Kiting through mangroves can be difficult. 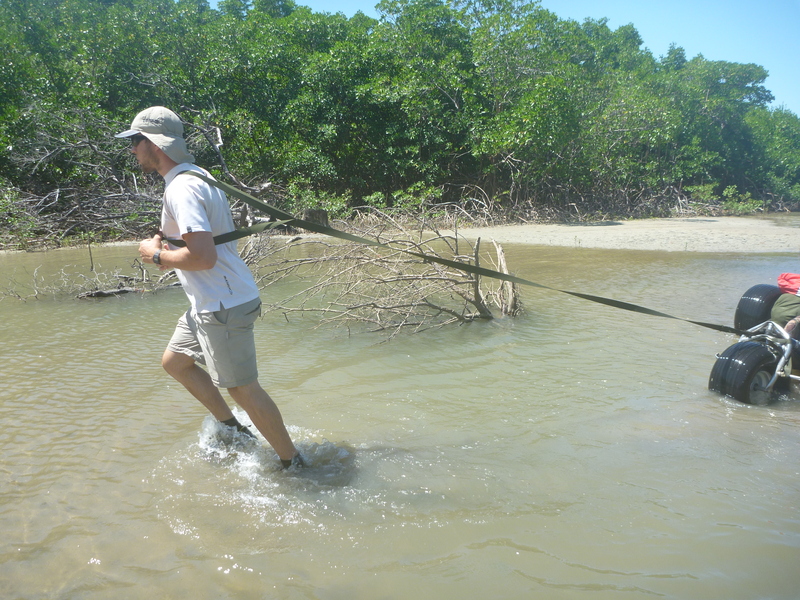 Walking through mangroves is definitely harder. When the mud reached knee high, we decided to head inland to the roads. For this stage of the coastline there were no sandy beaches – instead mud, mangroves, and rivers. However 74 gruelling kilometres later, we´re in Preá, our penultimate stop before Jericoacoara. Sandy, slightly tired and stinking of mangrove swamp, but happy! When walking that distance, the roads covered all merge into one memory. One endless stretch of asphalt with the occassional cobble, and not so occassional pot-hole or road-side palm tree. The equatorial sun rapidly makes the mind weary and kilometres long. We (almost!) wished for the good old British Summer. Jogging an endless stretch of road littered with heat-haze makes us consume 6-7 litres of water a day only stopping to pee once. Or was that too much information? We eventually found our way to the town of Aranau, where we hoped to stay for the night. Due to our 30mins on, and 30mins off we had managed a good rate of 6-7km/h, and arrived two hours earlier than expected, complete with a throng of kids. Throughout this advenure whenever we have slowed to walking pace we´ve been followed almost constantly by children and adults alike. Perhaps it´s the fact that there are no tourists in many of the areas we have been through, or that the culture of personal space is so different in Brazil to England. Alternatively it’s the huge odd looking tricycles; but in every settlement we pass through we seem to collect a loud and curious crowd of people who follow us to see what we´ll do next. Brazil’s Pied Pipers! As yet this hadn´t annoyed us, but after a marathon of walking one group of cheeky kids decided to try to jump into our buggies whilst we were towing them up hill, picking up our helmets and trying them on for size, and kicking the tyres. Once we had reached the beach at Aranau, our planned destination for the day, we decided to put the kites up and continue to the next day´s goal of Prea – if only to get rid of the annoying kids! After five minutes of fast kiting, we noticed two motorbikes were chasing us, so we verred off onto bumpy terrain, worked the kites a little harder, and managed to lose them, just as a wind farm loomed into view. The scale is hard to comprehend, especailly with the sun setting in your eyes, but with our 25 metre long lines we didn´t want to risk flying the kites too close to the sweeping blades. Having weaved in and out of the enormous turbines, our next obstacle came into view – a large river with no bridge or raft. We would have never done this a week ago, but knowing now how well the buggies float we accessed the currents and then simply drove straight into each river, bobbing along and controlling the kite, before rolling up the opposite bank. Five rivers, a stagnant swamp, and some epic dunes later, we finally rolled into Preá as the sun was setting. We are now staying the night in Villa Preá – a stunning eco-lodge on the beach. 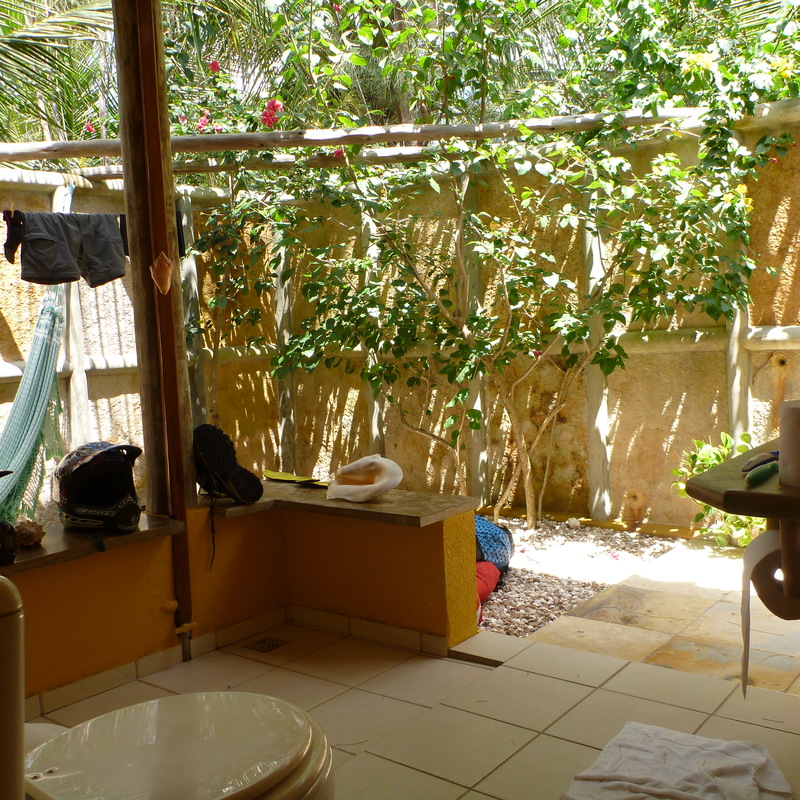 Interestingly our bunglow has an outside bathroom (slightly worried for everyone´s welfare once Harry announces he needs the toilet, the area may suddenly not be so eco after all), and seperate bedrooms each with double beds! Harry and I have got used to sharing a double bed between us the last 3 weeks, so I don´t quite know what to do with the space! I have conditioned myself into strictly not rolling over in the middle of the night expeceting a girlfiend, so I doubt I will be able to make the most of the extra space tonight! 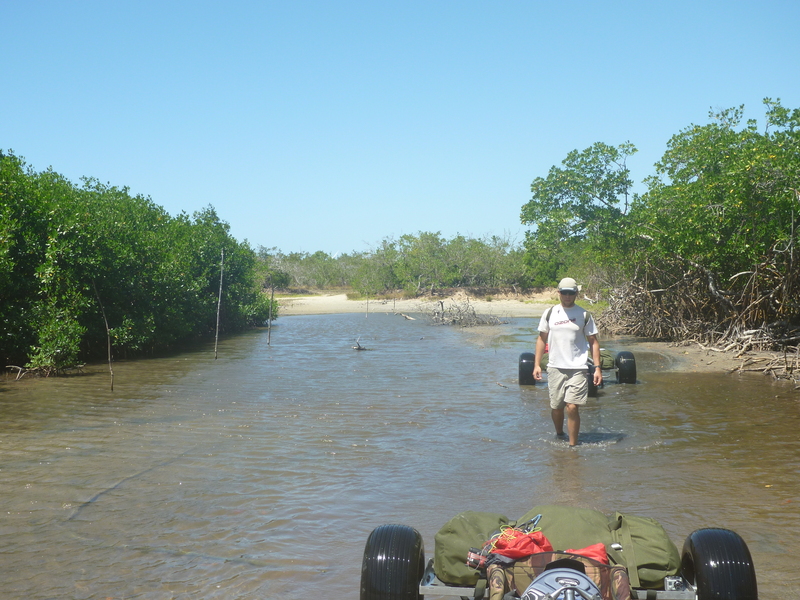 This entry was posted in Buggies, Journal and tagged brazil kite buggy, craig hansen, float buggy, mangroves, outlaw buggy, PLK, river crossing, swamp by Charlie Thuillier. Bookmark the permalink. Thanks Andres – will definitely do that! Great work chaps. Enjoy not spooning tonight. ¿ como es el kitebuggy delante de los molinos eolicos del parque? How is the kitebuggy windmill in front of the park? Hi Oxilarry – thanks for the comment. The translation is little strange though! Dodging the wind turbines was interesting but we kept well away from them so luckily no crashes!It was definitely an adventure to remember, as we have now reached our destination, Serrote Breezes in Jericoacoara.